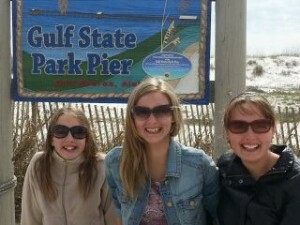 Well… our plans to stay for one month at Gulf State Park changed and we stayed until March 1st! Now my Android phone has automatically identified the State Park as “Home.” In many ways, it has truly become our Alabama “Home.” Yet, the time has come to move on. We belong to a number of different resort systems. Since we are camping 365 days a year, belonging to at least two resort systems is the best way to travel. Styx is part of the Ocean Canyon resorts. We stay for 2 weeks then move on to the next resort. I love the resorts. They have plenty of amenities. They always have full hookups for us. It is critical that we have more than just electrical hookups when staying for more than a couple of days at any location. We need to have running water and a sewer connection. SuzAnne and my girls like the resorts. Their first love is the State Parks. ALL of us LOVE Gulf State Park. It has all of the amenities of our resort systems, offers nature programs and the bike trails are first rate! Okay, this post is about Styx, so I will return to it. Styx is located on a very clear river. Though we are told there are no gators in this river because it is clear water, there are plenty of cottonmouths (i.e., water moccasin snakes). This excites our youngest, Éva, who grew to love snakes in Gulf Shores. Now that we have a place with no nature programs, we are able to work harder on school subjects and get ahead. Éva and Barry go to the indoor pool nearly every night. We are working on Éva’s lung capacity and ability to stay under water as long as possible. We are looking to introduce Éva to scuba diving next year. 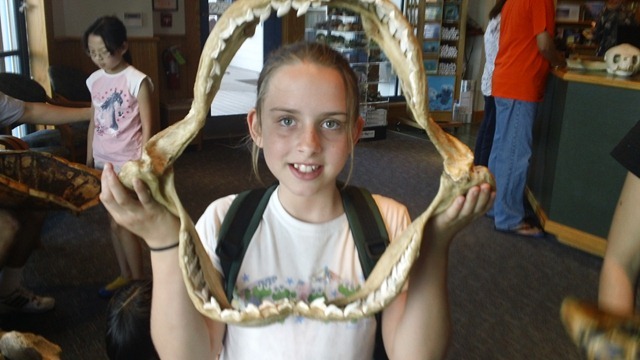 She wants to be a marine biologist in the future, so we are excited to be able to offer her this variety! Our dear friends just arrived today. They are here for the next two weeks until they migrate back to Michigan. From here, we go to Biloxi, Mississippi to explore the southern, gulf coast of Mississippi! Hello from Gulf Shores, Alabama! We were here last January and couldn’t stay away. Currently, we are staying at a state park at least through the end of January. We may not be able to make the girls leave! When we left Michigan at the end of October, we headed to Van Wert, OH, on business for a couple of days. From there we headed to KY, where we stayed a couple of weeks in the Mammoth Cave area. We loved it but colder weather and frozen pipes pushed us further south. We spent a couple of days in Columbia, TN, where we got to visit with family. 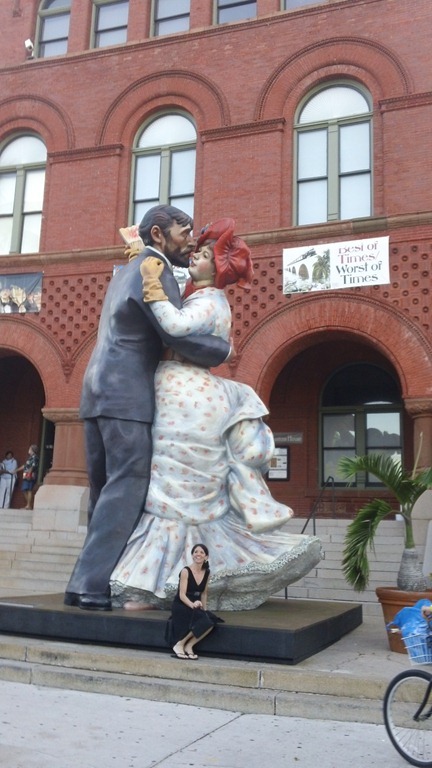 Vero Beach—Ahhhh, the Sweet Sound of English and Piano Duets! Friday, March 2—When we got out of the Suburban at our new park, Sunshine Travel RV Resort in Vero Beach, FL, we heard very welcoming and very much welcomed, “Hello! Welcome!! I see you are from Michigan.” We hadn’t heard much English since we left the Everglades and it was very nice to be able to converse freely with the nice man parked next to us. We really liked this park a lot and wished we could stay more than three nights. They have a beautiful pool in this very clean park with more spacious sites than those we left behind in Pompano Beach. After doing a little shopping, we walked around the park in the evening. It was cut a bit short when we saw what we believe to be a King Snake slither across the road. Saturday, March 3—We spent a lot of the day at the park. The girls love the pool and their newly found activity: diving for golf balls! After we got some laundry done, we went to the Atlantic to take a wake along the beach. Once again, we enjoyed a late night walk around the park. Sunday, March 4—This was a very special Sunday as we attended church with a very dear friend whom we haven’t seen for a long time and her husband whom we had only met briefly a few years earlier. After eating Sunday lunch at Southern Sisters Cafe, we headed back to their home where my friend and I were able to catch up on one of our favorite things: playing piano duets. We were able to get a piece together to play in her church for the service at her church that evening. Barry and the girls very much enjoyed the afternoon with her kind husband and their cute dog, Tinker Bell. We were all tired when we got home that evening but the girls wanted to walk and swim once again. Monday, March 5—Today was quite a bit cooler but we loved it! After grocery shopping and a coffee run to DunkinDonuts, we finished up school and prepared to have our friends over to have supper with us. We had a great night and felt that two days with them just wasn’t enough time. Before bed, the girls had to go for one more swim. It was quite late but I drove them to the pool (more on why we drove in a minute). It was in the 50s but that didn’t stop our MI girls. We had a good laugh because of the looks and comments we got about why in the world I would let the girls swim in such cold weather. We had walked and biked every chance we could while at this park; especially at night. This stopped today because wild boars were seen running through the park. Prompt action was taken by the management but because they weren’t yet caught, we chose to drive to the pool and stay close to our site. This was one park that we hated to leave. It wasn’t very big but it was very relaxed and well kept. We will definitely stay here again if we are in the area again. Monday February 27: After hearing more French than English while in the Keys, we were excited to head back to mainland Florida and English. From the moment we entered the gates of Breezy Hill RV Resort in Pompano Beach, however, we knew this wasn’t going to be the case. Most of the signs were in French and as Barry stood in line to register at the sales office, he hoped that someone would speak English. Fortunately, they did! We found out that about 90% of the park were from Quebec (we think 98% since the only U.S. license plates were ours from MI and a couple from Montana). It was strange to be somewhat of a novelty in our own country. “You speak English?” We joked that if a country wanted to invade Quebec, the winter months would be the time as most of Quebec seemed to be in southern Florida. We settled in at the new park quickly so the girls could get some swimming in before we had to get ready to celebrate the 6th anniversary of our business, Evmikna Graphics. 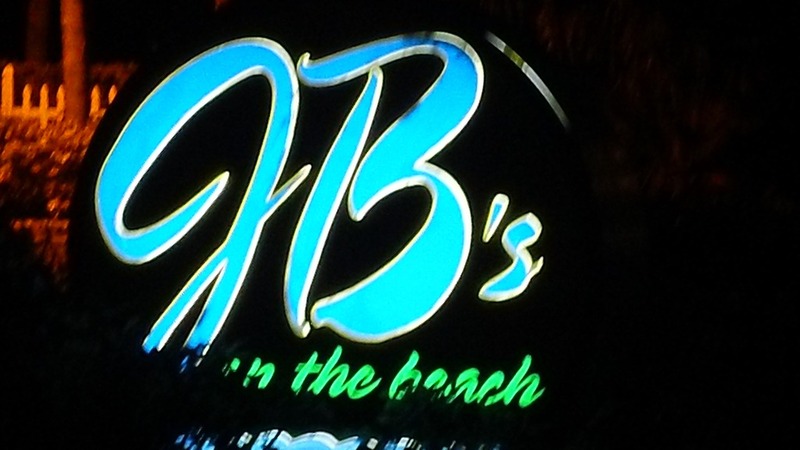 A local suggested we go to JB’s on the Beach. It turned out to be a very busy but beautiful restaurant right on the Atlantic. After our meal, we walked a bit on the beach before heading to McDonald’s for dessert—McFlurries. We chose to go through the drive-through after seeing several police cars and officers in the parking lot surrounding several young men who were on the ground in cuffs. When we pulled up to the window, we saw a police officer ‘hiding-out’ in the back of the restaurant. Barry made a comment to the cashier that this must be the safest McDonald’s in Florida at the moment. She kind of laughed, hardly seeming phased at all by all the commotion. We were a little phased and later wondered possessed us to stop at all! Tuesday, February 28: We mostly spent our time at this park on school. The park itself is very large but still the RVs are packed in very tightly. It was one of our more difficult back-ins as we were packed in like sardines. We did really enjoy being able to take long walks and bike rides, which we did several times each day and evening. 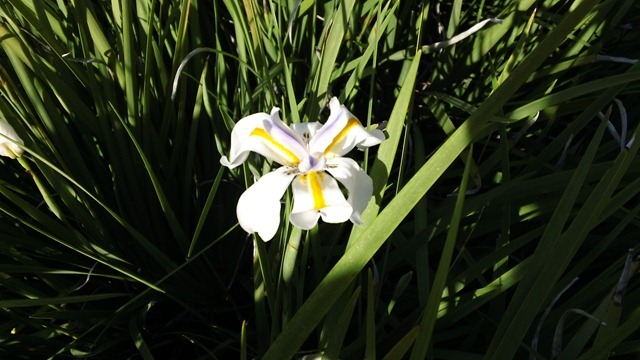 The park is also very well manicured with beautiful flowers everywhere. Wednesday, February 29 and Thursday, March 1—These days were pretty much the same: school, swimming, walks, biking, shopping. We celebrated Leap Year Day with more ice cream! Spring Break and the Florida Keys! It was supposed to be in the 70s while we were there but it turned out to be unseasonably warm and pretty much stayed in the upper 80s the entire time. We were very thankful for those great ocean breezes! The nights were beautiful and we enjoyed many long walks and bike rides. 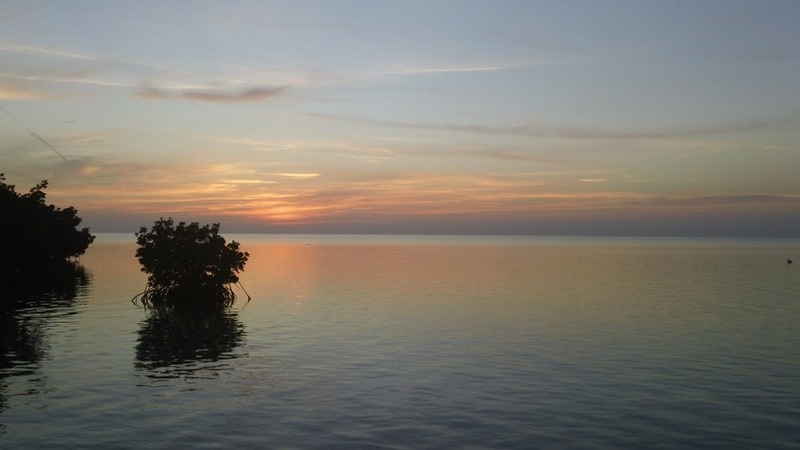 We never missed one of those famous Florida Keys sunsets! Monday, February 20— After we got unpacked and settled in at Fiesta Key RV Resort we drove to Long Key State Park and Curry Hammock State Park. Long Key was closed indefinitely and we just drove around Curry Hammock a bit to check it out. We watched our first sunset in the Keys from our RV Resort. It was not a disappointment! Tuesday, February 21—While we were in Louisiana we met a woman who had grown up in the Keys. She highly recommended that we visit the The Turtle Hospital in Marathon (http://www.turtlehospital.org/). 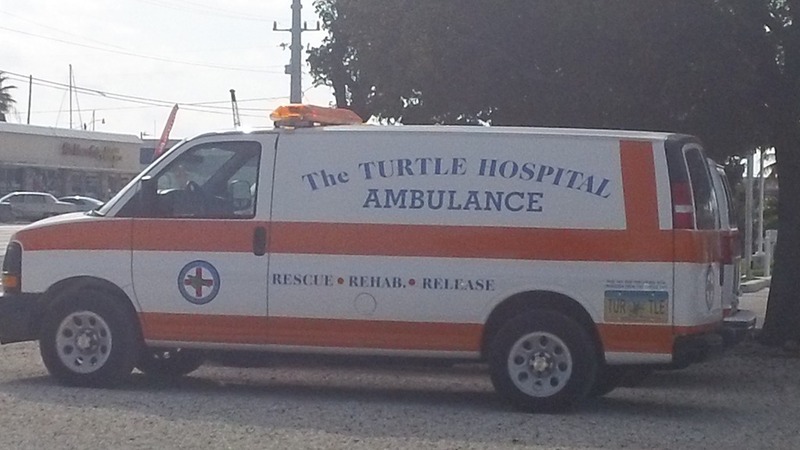 This wonderful place rescues and cares for Sea Turtles that have been injured. Some of the turtles eventually get well and are released back into the sea while some, due to their injuries, become permanent residents at the hospital. Our tour started with a presentation about Sea Turtles, their habits, the differences between the species, dangers they face, and the work of the hospital. Afterwards, we were taken on a tour of the Triage and Surgical Units of the hospital. The very best part was visiting the turtles. Those that are to be released are in smaller, individual tanks. A very large pool houses the turtles that live at the hospital. 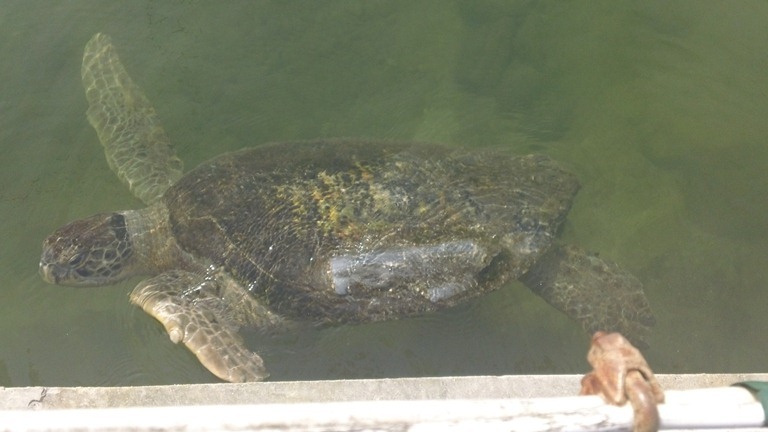 These turtles are used to humans and swam right up to the edge of the pool to greet us. Well…we thought they were greeting us but we soon found out that they knew we were going to give them treats! Their size astonished us. What we loved the most was how they made eye contact with us. Even the shy Kemp’s Ridley turtle came up to say hello (we were told that she doesn’t do that very often). Our tour was over far too soon but we learned a lot about these wonderful creatures. As we were leaving a large iguana made an experience on the dock near the turtle tanks. He’s not supposed to be there (invasive species) but he was interesting nonetheless. For the woman who suggested we visit this great place: Thank You!!! We are so glad we went! It was definitely a highlight of our time in the Keys. We spent the rest of the afternoon exploring some of the other Keys before coming home to the pool and another beautiful sunset. Once on Key West, we found free parking at a lot near White Street Pier. We decided to walk to the end of the pier to look for marine life. 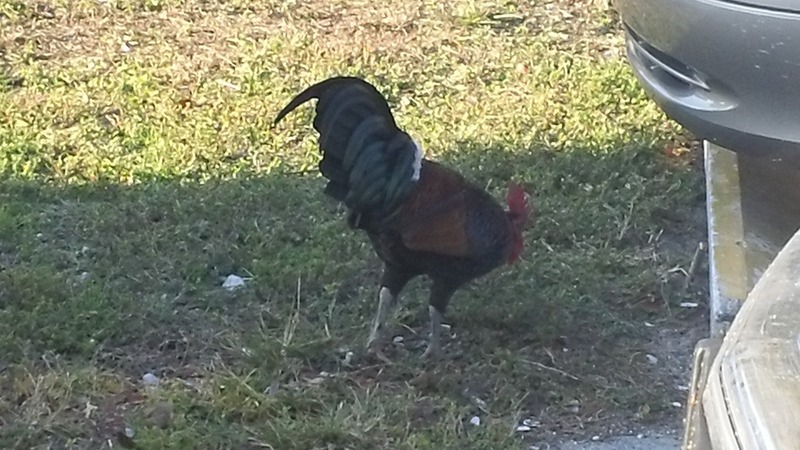 Before doing so, however, we were welcomed by several of the Key West Chickens that are somewhat controversial but are very much a part of the Keys. (We say, let the chickens stay, by the way!) Once out on the pier, we saw a lot of fish and sea urchins but what we found most interesting was a group of people daring each other to jump into the water (they thought it was cold). As we were walking around the pier, a dog started viciously barking at us. His owner was embarrassed and apologized. After talking for awhile we found out that the man, a self-proclaimed beach bum, lives and works on Key West. He moved to the Keys about a decade ago from the East Coast, sold his car, bought a bike and never looked back. He gave us some great ideas as to some family friendly spots on Key West. We spent the rest of the afternoon at Fort Zachary Taylor State Park (http://www.floridastateparks.org/forttaylor/) where Barry and the girls enjoyed snorkeling while my book and I found a quiet place under a shade tree. As sunset approached, we packed up and headed for Mallory Square (http://www.mallorysquare.com/). We enjoyed the very unique live entertainment, shops, and another amazing sunset. By this time we were all starved. We walked and walked and walked the streets of Key West in search of a restaurant that offered gluten-free food before finding one that very reluctantly agreed to grill a plain hamburger and make a salad for our g-free kid. It was pretty late by the time we got back to our truck and headed home but we knew we would enjoy the miles of bridges and Keys ahead of us. Thursday, February 23—On this day we decided to to absolutely nothing and we loved every lazy minute of it! Barry ran a couple of our bikes to a shop for repairs. Other than that we read, napped, played games, and watched movies. 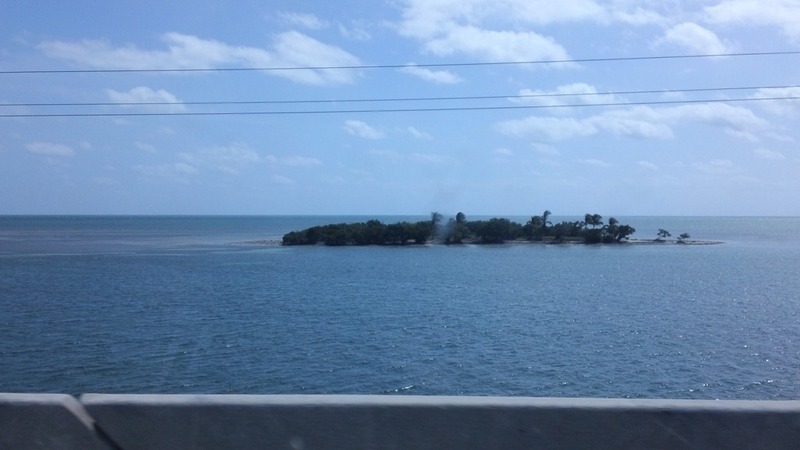 Friday, February 24—We drove to Key Largo today in search of Key Lime Pie which isn’t normally a problem on the Keys, but we needed gluten-free. There was none to be found on Key Largo but we did find out that we could get some on Big Pine Key. Before leaving Key Largo, we stopped at a neat shop that had several types of shells that we had never seen before. We also enjoyed walking through a real scuba shop (real as in not your “scuba” section at Wal-mart or K-Mart). Once on Big Pine Key, we saw some of the endangered Key West Deer. Unfortunately, the shop was out of g-free Key Lime Pie but the woman running the shop very kindly called and ordered one for us to pick up the next day. 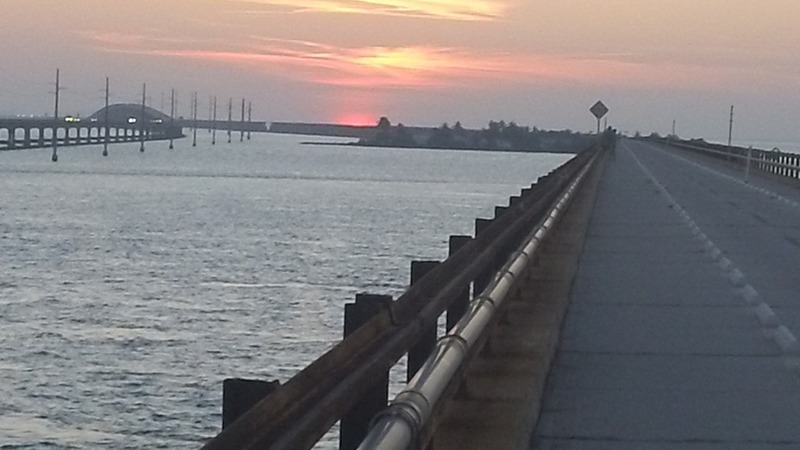 On our way back to the resort, we stopped at Old Seven Mile Bridge to watch the sunset. We were delighted to see several sea turtles and manta rays in the waters below the bridge. Saturday, February 25—After spotting the marine life on Old Seven Mile Bridge the day before, we knew we had to return! It was very hot and although the sun was relentless, we walked to mile marker 1 3/4 to have what 2 passing joggers told us would be a, “a National Geographic experience.” We were not disappointed! Reef, lemon and nurse sharks, a bull shark, huge manta rays, stingrays, sea turtles, a pod of dolphins, tarpon and several other species of fish were in the calm waters around the bridge. We stayed too long and got sunburns but it was truly the experience of a lifetime! When we finally pulled ourselves away from Old Seven Mile Bridge, we drove back to Big Pine Key to pick up our pies at the Key West Key Lime Pie Company (http://www.keywestkeylimepieco.com/). We saw more deer and chickens on the way. Before picking up our pie, we stopped at a little restaurant called Shirleys (http://floridakeysicecreamshop.com/) for some really good sandwiches. 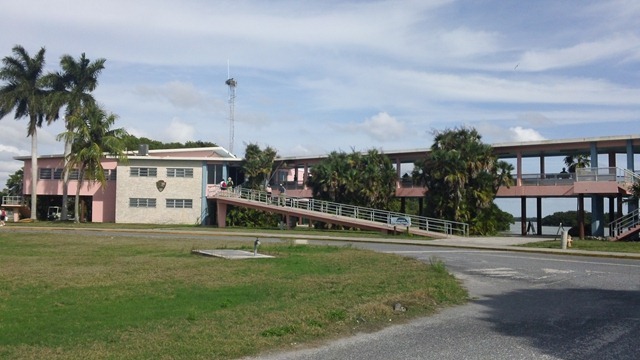 We then picked up our pie and headed over to the Key West Deer Visitor’s Center (http://www.fws.gov/nationalkeydeer/keywest/). Not only was this place really interesting (with a great touch table about the marine and animal life that can be found on the Keys) but it was a great resource for family friendly activities on the Keys. We wished we had stopped here on our first day. Unfortunately, we didn’t have time to do most of the things they suggested but we wrote them down for future use. We highly recommend stopping here first if you are looking for family friendly activities in the Keys. 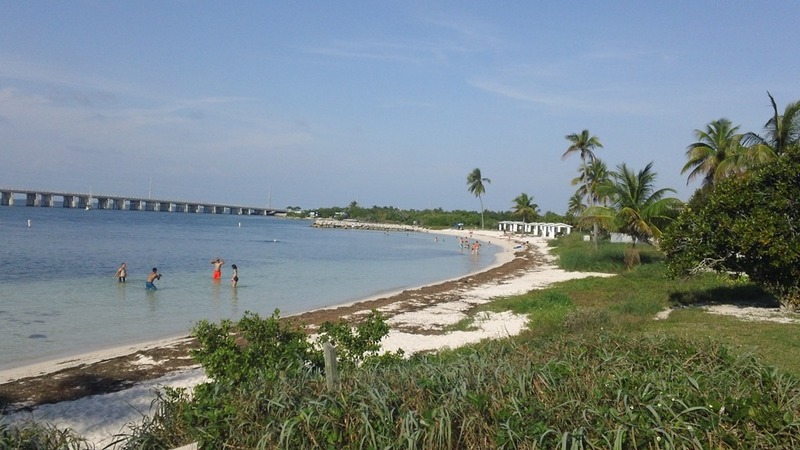 Our next stop was Bahia Honda State Park (http://www.floridastateparks.org/bahiahonda/) which is also on Big Pine Key. We enjoyed our Key Lime Pies (the gluten-free pie was delicious—there was no telling that it was g-free). Barry, Mikayla and Eva snorkled while Jenna and I walked every inch of this beautiful state park. As sundown approached, we walked to the broken bridge at the park to view the sunset. There we met a couple from Maine whom we enjoyed talking with very much. Afterwards, we headed down to an outdoor classroom for a ranger-lead class on the stars which proved to be one of the most interesting classes we have taken to date. In fact, we still talk about the class and have become avid star gazers because of it. Since our favorite spot was Old Seven Mile Bridge, we chose it as our spot to watch our final sunset. It was the most beautiful yet. There are some free things to do but most things are quite expensive. Keep your bikes locked up at all times! A local told us they have a lot of problems with bikes being stolen. Google or the visitor centers weren’t much help in finding family friendly activities in the Florida Keys. 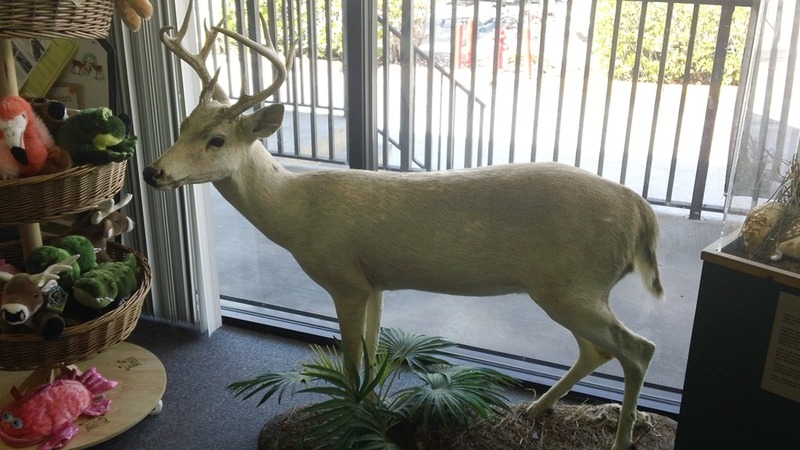 The Key West Deer Visitor Center is your best bet! They also know the places to get good deals; especially on Kayaks. There a couple of resorts in the Keys that cater to families. We didn’t stay at one but read about day camps that are offered for the kids while the parents play. Biscayne National Park—An Underwater Treasure! February 19—I woke up to the sound of the air conditioning turning on and thought maybe one of the girls had accidently messed up the thermostat. That wasn’t the case, however. It was just going to be a hot day! In the afternoon, we took the beautiful drive to Biscayne National Park. We were very disappointed to find out that most of the park is only accessible by boat (unless you have your own, it’s quite expensive to charter one) but we decided to go ahead and visit the Dante Fascell Visitor Center at Convoy Point. We were so glad that we did! February 15—Flexibility has become the name of the game on this trip. We left Pine Island (St. James City, FL) with a plan to stay at an RV Park located at the north side of Everglades National Park. Our trip to the park was very interesting with each of the girls seeing over 100 alligators (yes, they counted) in the water that is along US-41 and a lot of water birds. Once we got to our new park, however, we knew right away that it wasn’t going to work out. It was not a well maintained park and there were no bathrooms. We called several RV and state parks but couldn’t find any with vacancies. Our only hope was to head back on US-41 to Midway Campground which is part of the National Park. They don’t take reservations and it was already late in the day. Our relief was very great when the park host greeted us with, “This is your lucky day. We have one spot left!” He gave us our information and then put out the “No Sites Available” sign. 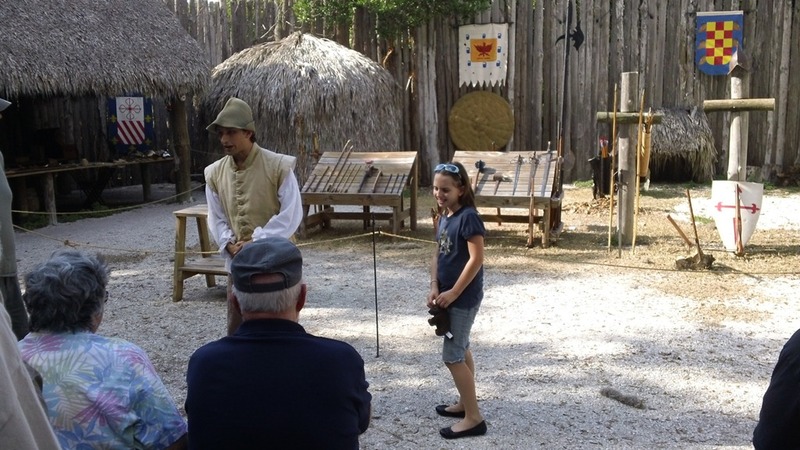 Midway Campground is not far from Big Cypress National Preserve. After a quick set-up, we headed over right away so Eva could get her Jr. Ranger Badge and the girls and I could get our National Park Passports stamped. This particular Jr. Ranger book is for Big Cypress National Preserve, Everglades National Park and Biscayne National Park. It is very comprehensive and while she only had to complete three pages for each of the three parks, it took a quite a bit of time at each. We found the book to be very helpful in furthering our understanding of the very diverse eco-systems of these three national treasures. After Eva got her badge, we went out on the boardwalk where we saw a lot of alligators, fish, lizards and water birds. The ranger who had previously sworn Eva in as a Jr. Ranger spent a lot of time with us on the boardwalk. She answered our many questions and taught us so much about Big Cypress and its relationship to the Everglades. Several lizards ran around as we talked. We learned a great deal about them from her as well. This was our first time camping at a National Park on this trip. While it was a very beautiful and peaceful campground, it didn’t take us long to figure out that it was a dead area for our phone and internet service; both of which are critical to our businesses. It was with great regret that we went back to the camp host and told him we would have to leave the next morning. February 16—We packed up bright and early the next morning and headed out once again. This time we had no clue as to where we could to stay, no phone service with which to call ahead and a hope that we weren’t leaving the only campsite available in southern Florida. Before leaving US-41 we stopped at Shark Valley Visitor Center which is part of Everglades National Park. Barry was able to get a signal so he sat in the truck for awhile with the computer open and phone in hand trying to book a campground while the girls and I went exploring. When Barry and I were discussing this part of the trip I had told him that I really had no desire to visit the Everglades but that I thought be should at least stop long enough for Eva to get her Jr. Ranger Badge. I thought the Everglades was just a huge, alligator and snake infested swamp. 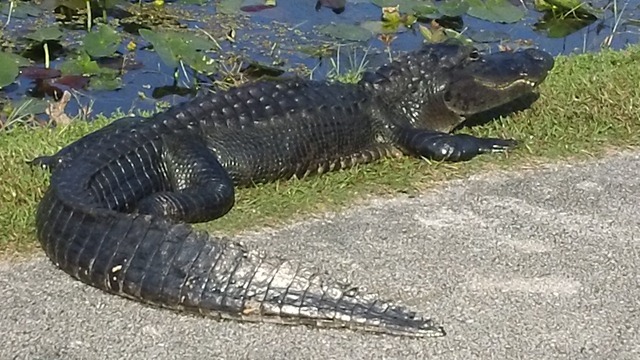 Last summer we sat with friends around a campfire and heard their stories about Shark Valley and look at the pictures of them biking a trail on which they often had to swerve to miss large alligators. They told us what a wonderful place this was and that we had to go. We all remained steadfast that we would never walk or bike that trail but would happily view the alligators from atop a deck. About a week before heading to Shark Valley, Barry got a facebook message from one of them saying, “Promise me that you’ll go to Shark Valley!” We decided to stop but we would only look around a bit. As the the girls and I headed into the Visitor’s Center, we saw the trail. There were already several walkers, bikers and photographers out there…and ALLIGATORS!! We decided to just go to the beginning of the trail for a little look. Emboldened by so many other people, we were soon on the trail ourselves. The farther we walked, the more we saw and then the more we wanted to see. 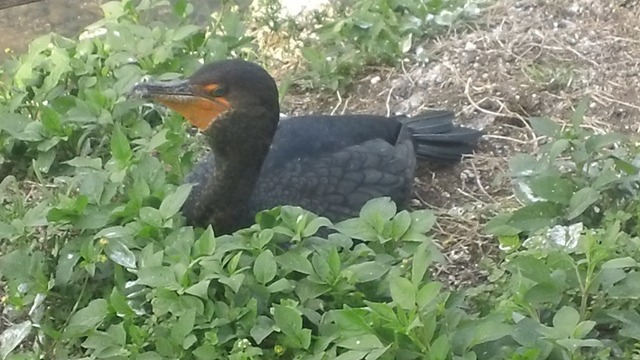 There were so many water birds nesting, hunting or just seeming to stand ready for their picture to be taken (Jenna now calls me the ‘bird paparazzi). 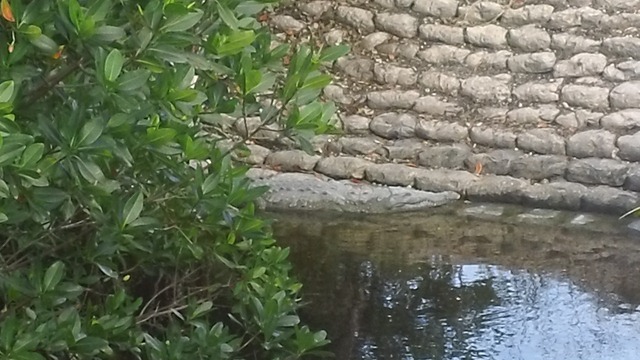 There were turtles, alligators of all sizes-even babies, lizards, butterflies, and beautiful plants and flowers. We soon realized that we were beyond the crowd and agreed that we would feel better if Barry was with us. On our way back, there were more people and MORE alligators. As a matter of fact, the trail looked quite different because the alligators were moving out of the water and up onto the trail to sun themselves. We soon found Barry who was a little shocked that we had become so brave. He had found us a spot for the next few nights in Florida City which made us all very relieved. It wasn’t far so we could spend as much time as we wanted at Shark Valley. The girls and I were eager to show him all the things we had discovered, so we headed back out to the trail. We walked the trails for quite a ways and then headed back to take a boardwalk that went into a thickly wooded area. About half-way in, Eva jumped and said that she had seen a snake. Barry and I thought it was probably just a lizard but then Jenna said that she not only had seen it but was looking at it. 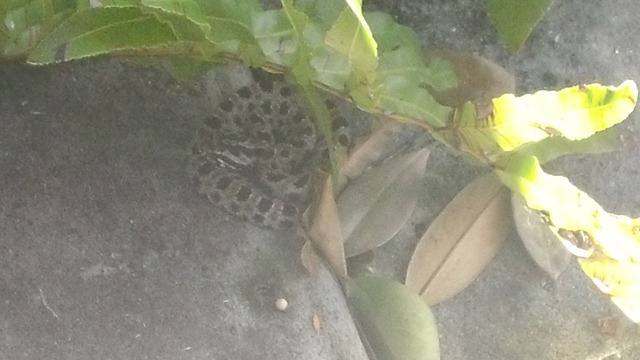 Sure enough, there was a small snake coiled up under some leaves. I quickly snapped a picture and jumped out of the way. Rangers later identified it as an adult Dusky Dwarf Pygmy Rattlesnake. They were very glad we had left it alone. After reading about it, so were we! The Visitor’s Center at Shark Valley is small but worth the stop. Knowledgeable rangers and volunteers eagerly answer questions. There are some good hands-on displays that were of special interest to the girls. We bought an interesting little book about where animals go during hurricanes from the bookstore. One of the volunteers took us to a map and explained more of the relationship between Big Cypress, the Everglades and the coastal waters. He also explained to us the threats the Everglades face and what is being done to protect this beautiful and valuable ecosystem. We’re very thankful to our friends for persuading us to stop at Shark Valley. Our time there was just the beginning of a few days in this area that is truly a wonder of the world. The Everglades cast a spell over all of us and we were eager for more! 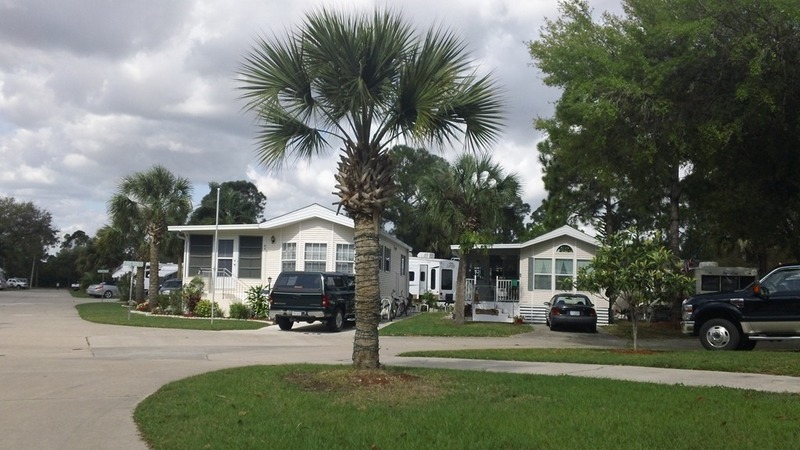 That afternoon, we moved to Southern Comfort RV Resort in Florida City, Florida. (It’s a very nice, clean place!) 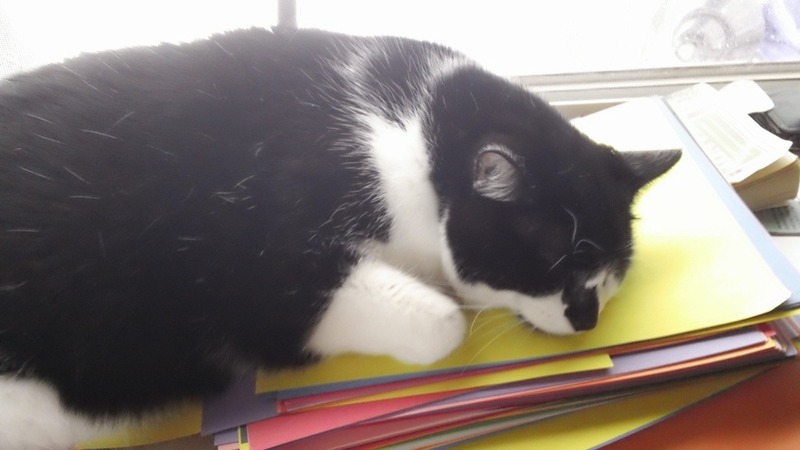 We hit the books hard for the rest of the day. Eva and I went for a walk later in the day to look for leaves she needed to finish a Science project. As we were heading over to an area that was outside the park a man yelled, "Hey! You aren’t going into those trees are you?” I told him that we were just going to the edge of the woods to collect leaf samples. He told us that the area is infested with snakes and that we best stay away. He then asked us why we needed the leaves. We told him and he very graciously invited us to look through his garden and take what we wanted. He pointed out the different types of plants (many we had never before seen), gave us all the samples we wanted, and an impromptu Botany class! He even gave her a prickly pear bud to replant. The world really is our classroom and I’m so thankful for those who take an interest in the girls’ education! February 17—We started the day with school in the camper and then took school into the Everglades to the Ernest Coe Visitor Center in Homestead, FL, where the rangers and an interesting movie became our teachers. 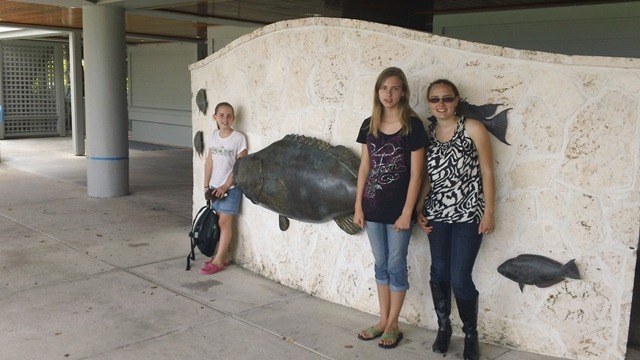 Here Eva finished her requirements for the Everglades portion of the Jr. Ranger book. The Visitor Center is quite interesting and gave us a deeper understand as to what the Everglades really are and are not. Barry and I had always learned that the Everglades is a large swamp but it is really a very complex ecosystem that makes up the largest subtropical wetlands in the United States. We were expecting a dark, cypress filled area with alligators and snakes at every turn. It is a river of grass where the slightest change in elevation can produce different types of fauna and thus different habitats for a wide variety of animals. We had it in our heads that we needed to take an airboat ride into the Everglades. Because they take place within the National Park, we assumed it would be educational even though they are run by concessions that aren’t a part of the National Park Service. Our experience was far from that. We paid a lot of money for a 20 minute ride on an airboat in which we saw only about a dozen alligators and some water birds. The main part of the ride consisted of going out into the Everglades as fast as we could to do three 360 degree revolutions in the airboat. Our admission fee also included two short shows; one featuring snakes and the other alligators. Both were less than 15 minutes long. During the snake show, the handler pressured a woman from the crowd who was obviously very afraid of snakes to hold a small ball python. He conned her into going down to the front with him where he sneakily put a very large python onto her shoulders. He seemed to delight in the control he now had over her and would not remove the snake until she said, “I’m not afraid of snakes.” To make matters worse, she didn’t speak English very well so not only was she frightened but also couldn’t understand what he was trying to get her to do. 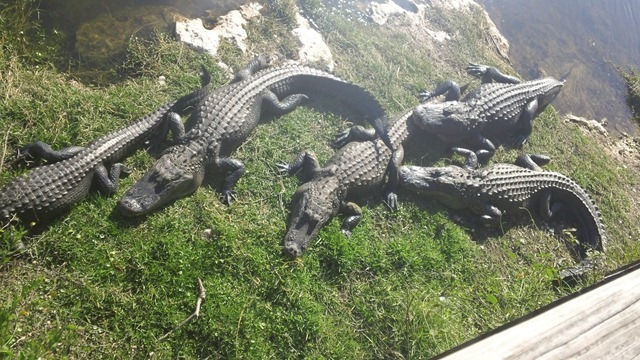 The alligator show was nothing more than stunts concocted to abuse the poor animal in the name of entertainment. I could go on and on about the insufficient and dirty areas in which the animals live. Our girls were not impressed and asked us if we could just stick with the National Park from here on out. The next day I relayed all of this to a National Park Ranger. She told me that there are a handful of airboat rides that are educational and worth the trip. If you ever go, please investigate these concessioners thoroughly so you too don’t waste your time or money and further encourage people in the abuse of animals. Better yet, take the tram ride with the National Park Rangers at Shark Valley or hike the boardwalks in Everglades National Park where you will see many, many alligators in their natural habitat. There are also privately operated boat tours of the Florida Bay area at Flamingo Visitor Center. 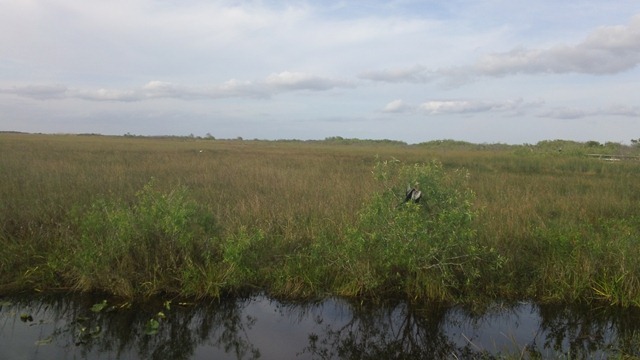 February 18—Driving through the Everglades is interesting because there are so many new things to see. 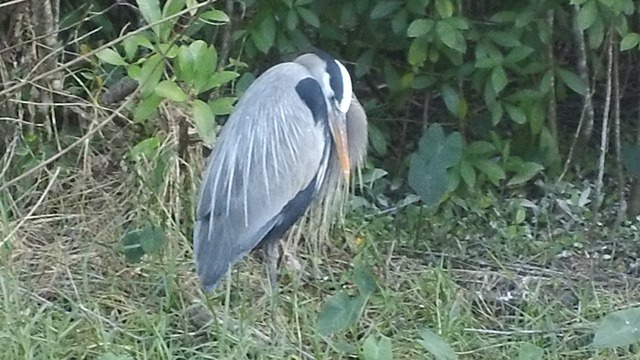 Besides alligators there are water birds of all types, subtropical plants and Panther Crossing signs! Unfortunately, we didn’t see any panthers but the signs kept reminding us that they are indeed there. Our first day driving through, we saw prison work crews working on the roads along the canals where we saw so many alligators! We also passed many fruit and vegetables farms. It was very interesting to see corn that wasn’t “at least knee-high not by the 4th of July” but by the middle of February. Migrant workers swarmed the fields from morning until dusk picking everything from berries to beans to papaya. We drove past such farms on our way to Flamingo Visitor Center in Flamingo, Florida, which is also a part of Everglades National Park. After you enter the park, it’s a long but very interesting and pleasant drive back to Flamingo. When we arrived at the park, we walked under the flamingo colored buildings and right onto Florida Bay. Spotting a ranger, I turned to Barry and whispered, “Can you imagine being a ranger at this park. It’s paradise!” This same ranger lead a fascinating class on the mosquito which we attended. 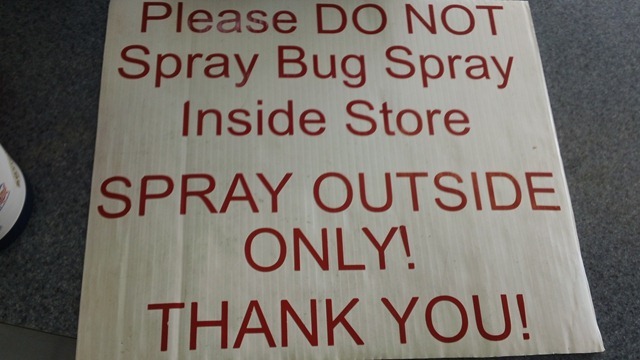 After hearing how thick the mosquitoes are in the summer months at the park, we decided that it’s not always paradise and wondered how they can take it! She told us that the first thing she was given when she was hired was a set of keys and a special mosquito coat, which she passed around for us to look at. It was also interesting to find out all the ways in which they deal with the pesky insects, how their pants literally look like they are crawling when they are outside of the buildings and how camping at Flamingo is free during the worst of the mosquito season because they figure anyone who can handle the mosquitoes deserves free lodging. We also learned a lot about the life cycle of mosquitoes and the part they play in the ecosystem of the Everglades. She also discussed the various types of repellants and what are most effective. The class made me think about those t-shirts we often see in Michigan that have a large mosquito on them with the caption, “Michigan’s State Bird!” I think that honor goes to southern Florida!! After the class on mosquitoes, we headed into the Visitor Center where we learned so much about this area of the Everglades. It was a very busy place but there were plenty of rangers present to answer questions. There was also a “mobile museum” outside the center that was attended by a ranger. We were eager to see more wildlife so we walked around the water’s edge where we saw more manatee and a couple of fearsome looking crocodiles! On our drive out of this part of Everglades National Park, we stopped at Snake Bight Trail1 and hiked for a bit through the mangroves. 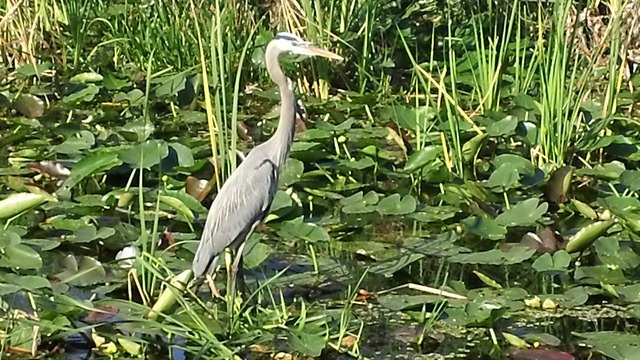 We saw a lot of beautiful water birds, interesting plants, seed pods and butterflies. We met a photographer on the trail who had been hiking through the Everglades for a several days. 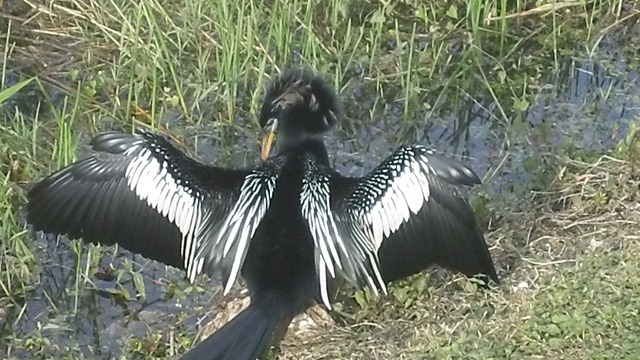 He encouraged us to hike Anhinga Trail which is located at the Royal Palm area of the park. When we asked him what we would see there his was reply was, “Everything!!! !” He was right. I can’t say how many alligators and turtles we saw because there were so many. The many species of birds must have decided to put on a show that day because they were out in full force hunting, diving, soaring, nesting and preening. They all seemed to want our attention because the chatter was incessant. The path was well marked with plaques that not only identified the various types of fauna but also gave brief descriptions of each. This was especially helpful for our youngest, whom I have mentioned before is studying Botany for this school year. For the rest of the semester she has to work on a field guide the explores the plants in our backyard. Our backyard is very large right now and this part of the Everglades was very helpful. 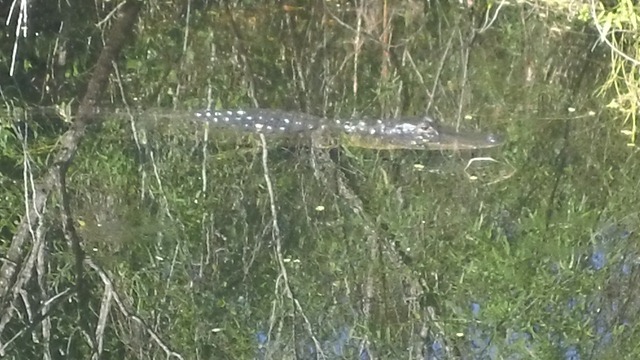 As we left the park, we made one final stop at a ditch where we had seen scores of baby alligators earlier in the day. There were only a few at this point, but they were very cute and the girls enjoyed finding them as they were well camouflaged in the water. Our initial lack of interest in the Everglades turned into four days of exploration and a strong desire to return one day. The hours we had spent at this National Park had only allowed us to scratch a very tiny part of the surface of this amazing place. Lots of School But a Lot of FUN Too! 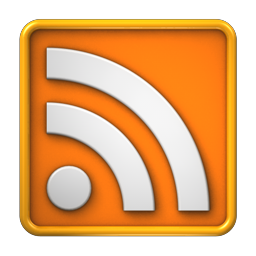 The cardinal rule of blogging is that you must keep up with it every day. I have more than broken the rule! This has mostly been because we hit school very hard the first couple of weeks we were in Florida. We wanted to be able to spend as much time as we could with family and friends we have in the Sarasota area and we also wanted to be able to take a spring break without getting behind. I’ll give a brief rundown of the days I’ve missed and then I’ll hit Everglades National Park and Biscayne National Park in separate posts. Yesterday, January 28, was supposed to be a sight-seeing day but we all decided to stay put and enjoy our current park and the beautiful weather. The girls and I took a couple of walks on which we noticed buds on the trees. Spring has come to Florida although it’s hard for us to really appreciate it having not gone through a winter. 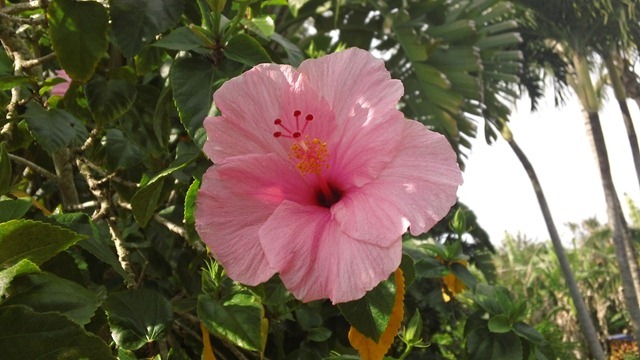 Flowers are beautiful anytime of the year, however, and we are enjoying all the azaleas, roses and many other flowers. The weather has been perfect: 70s during the day and cool enough at night to be perfect sleeping weather. Barry and Eva went out on a boat to do some fishing but got stuck in the mud. As they came back to the camper, covered in thick mud up to their knees, I heard Eva say, “Well, this is a memory right?” Barry replied, “Not this time! I’m going to erase this one from my memory forever!” I didn’t ask any questions but told them they couldn’t come into the camper until they were clean. They finally got the thick, sticky goo off their legs and decided that a game of putt-putt might be a better idea. 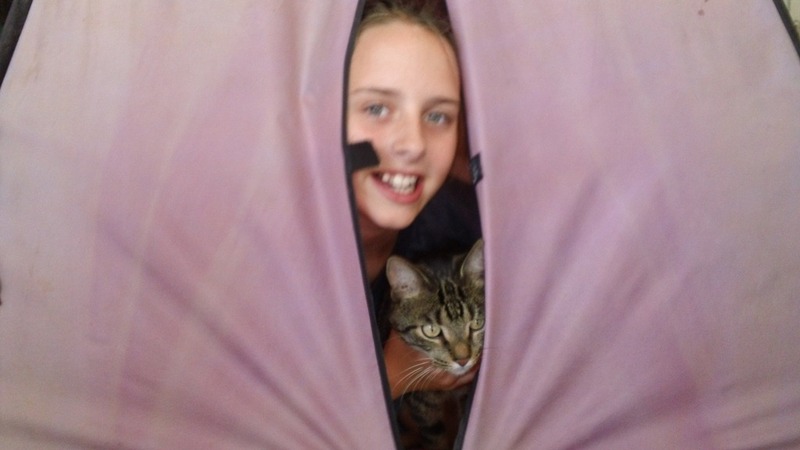 Jenna and Mikayla went with them while I got some things done in the camper. Barry got a business call yesterday morning as we were packing up to leave Henderson Beach State Park. The girls and I stepped outside to make sure we had everything packed up when we heard the roar of the waves from the Gulf. A storm was moving in so we quickly ran down to the beach to see how high the waves had become. We found them to be a only little bigger in height but massive in length. There was no telling where some of them began or ended. They also formed much farther out and came in much faster. They seemed to explode when they hit the shore. It was a beautiful morning so it was hard to imagine that a powerful storm capable of producing tornadoes was on its way. Eva was delighted to find the high-tide had spared her ‘sandman.’ She even put her cheek next to his and gave him a big hug goodbye!